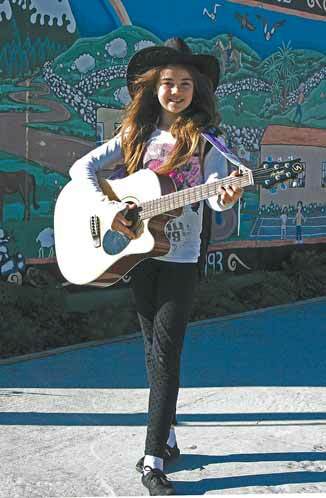 Te Horo’s musical wonder, 11 year old Peyton Morete, won the individual performer section of the Smokefree RockQuest competition in the recent Manawatu regional heats, singing her own song and accompanying herself on guitar. It is more usual for entrants to this annual competition for soloists, duo’s and bands, to be college-aged students, but this is the second year Peyton has entered and been placed: her win gives her automatic entry into the national finals. She has performed at various fairs, clubs and cafés around the coast and at the Zeal youth centre in Wellington, which encourages young people in the arts. Before the finals, Peyton has to prepare a 15 minute video of herself singing and playing her own songs. This goes to the judges, and the grand finalists will be selected from the videos sent in. It is the same selection process from all regional winners of the duos and bands. Those selected go the grand final to be held in Auckland in September. Meantime, she will play at the Manawatu finals on July 4, but as an entertainer.